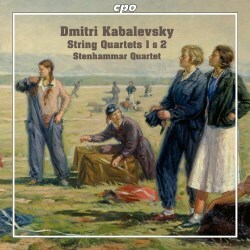 Some years ago, I wrote that the Olympia label was the home of Kabalevsky on record. There were at least ten volumes for this composer; almost as many as Olympia produced for the now flourishing Vainberg. Olympia even commissioned its own Hungarian recording of the first two symphonies and licensed a complete Colas Breugnon opera from Russian sources while the rest of the crowd were wading in the shallows with just the glitzy blitzy overture. Now long gone, that label - with its deep and wide Melodiya connection - has been relegated to Amazon/Ebay and sporadic licensing deals. CPO have stepped forward. The latest issue from Osnabrück is of the otherwise unknown string quartets. These have been newly recorded by CPO. I have taken this as the cue to note the existence of CPO's other Kabalevsky discs, all of which have been freshly and sympathetically recorded. The Four Symphonies have been reviewed here already but what about the concertos for cello and for piano? Taking the String Quartets first. There are only two, of which the First is a product of the young composer's final study years with Myaskovsky. It’s in four movements (I. Andante - Allegro Moderato; II. Vivace; III. Andantino; IV. Allegro Assai) which feel thematically linked. It is a most accomplished and eloquently communicative piece, yearning and rippling with Slav melancholy. Its finale, with eyes a-glint, is a whirling Bartókian catherine wheel of sparks and stamping dances - half Russian-half gypsy. It has a haunting beauty that is singing and aspirational when it pauses to gather its lyrical breath. Next time you would like to rest Borodin 2 then you need look no further. His Second Quartet is in an unconventional five movements (I. Allegro Molto ed Energico; II. Andante non Troppo; III. Scherzando Leggiero; IV. Adagio Molto Sostenuto; V. Adagio - Vivace Giocoso). It dates from just after World War 2; the same era as the same composer's Cello Concerto No. 1 and his teacher, Myaskovsky's, famously autumnal Cello Concerto. It is another lyrical and straight-speaking work, easy of access but with a more acidic tone than the 1928 quartet. I should just note that the first movement is full and broad of tone yet with wildness not undersold. It attains something close to haunting desperation above which a melody fully worthy of Myaskovsky unwinds over top. The fourth movement is resonant and vibrant. The Stenhammar Quartet, who have already established strong credentials with their Atterberg, Larsson and Stenhammar, hold nothing back. If this recording and these performances had skin they would have vitality springing from every pore. I have not heard the long-deleted Olympia CD (OCD293) of the quartets as played by the Glazunov quartet. In any event, it's only obtainable secondhand at a very high price via Amazon. 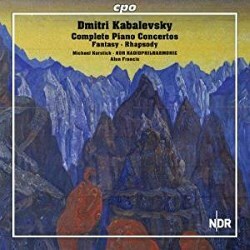 Kabalevsky is better known for his piano concertos. Listeners will become instant conquests for these works unless they must have a stiffening of gloom and tragedy. Not quite in the same constituency as Shostakovich's Second Piano Concerto they are close cousins. My first experience of them was of the Third in on a Supraphon LP (SUAST 50 488) where Pavel Stepan was the pianist with the Prague RSO conducted by the much underrated Aloys Klima. I needed no further encouragement and while Naxos, Olympia, Russian Revelation and Chandos have weighed in over the years only CPO have given us a set with the complete works for piano and orchestra. Michael Korstick and Alun Francis start with the three-movement First Piano Concerto - the longest of the four. In its sweetly countenanced temperament it feels disarmingly English at first. Soon it rises to emotional eminence and then spatters along like a super-fast Rachmaninov. Derivative it may be, but it's calming, mercurial, sparkling and entertaining with the singing heights of romance securely tapped into the Russian soul. The next movement finds peace but it's a bit faceless until it launches into a set of brilliantly expressive variations. These delve into an indomitably Russian spirit. The finale leans on Prokofiev's cut-glass diamantine brightness and glances back to the first movement - stern, grand, gemlike and exciting. The Second Concerto, in its original 1935 version, is strenuous but not at all as engaging as its predecessor. As compensation, it rises to some sumptuous string writing rather like Myaskovsky at best (5.03, I). Soon the sparks begin to dance and the jaunty writing for orchestra captivates. Was Shostakovich inspired by this in the late 1950s when he turned to writing his own Second Piano Concerto? There's an Andantino Semplice with a sweet and mournful melody typical of Balakirev, swirled over by creamy pianistic complexity. Listen to that lovely light melody from the violins at 2.18 followed by some fantastic grandstanding leading to a sumptuous slow brimming climax. The finale is a splintery sprint of an Allegro Molto complete with chattering xylophone. Pessimism about the work based on impressions at the start of the first movement are utterly confounded. Disc 2 launches with the well-known Third Concerto which, like the Violin Concerto and First Cello Concerto, was dedicated to Soviet Youth. Have you noticed how each of the piano concertos is shorter than its predecessor? The first movement flashes along cheerfully and boasts a great counter-melody. Kabalevsky was a masterly tunesmith. The writing is not subtle but who cares? It's exultantly brash and when it's being pensive it is part-Rachmaninov and part-Balakirev - every bit the melancholy Slav. The second movement, with its pizzicato, evokes icy winter bonfires and the plucked instruments have nicely varied and distinctive dynamics: delicate but resilient. After more Nutcracker innocence at 2.51 the music rises to a viscous grandeur. The rapped-out lighter finale is all joyous chatter which is honeyed around with woodwind and accentuated by the xylophone. The vainglorious circus jollity is cast off at 4.46 for a moment of climactic gold. The Fantasy after Schubert D940 rings out from the piano while the background writing for orchestra is tense and hushed. After some Lisztian bravura there are some stormy and haughty Brahmsian trills and the whole thing goes up in a phantasmagoric display. Never fear though, there is some still magic offered along the way. The Rhapsody for Piano and Orchestra on the theme of the song "School Years", Op. 75 is suitably playful and surprisingly purposeful. There is some nice use of woodwind, again typical of Balakirev. After some dreamy paragraphs the piano raps out with raucous alacrity and there's a cheekily snatched end to remind us that Kabalevsky knew his craft. We conclude with the shortest of the piano concertos: No. 4, Op. 99 Prague. Aristocratic piano writing contrasts with the peasant grunt of the orchestra. A pensive middle movement conveys a degree of discord and grainy sorrow before a libation of pulse accelerant and machine-gun side-drum suggest echoes familiar from Shostakovich 2 and the hustle-bustle of the Easter Fair. The finale ends brutally abrupt. Recording and performances do not disappoint and although the orchestra sometimes seems a mite backwardly set everything is clear. The documentation by Charles K Tomicik is finely detailed and out of the academic solipsistic quagmire once found so often in CPO liner notes. These are good on facts and observation rather than plunging into cerebration. They run to 14 pages and are in German and English. The notes for all the discs addressed here are good. Don't turn your nose up at this fine set of straight-talking piano concertos. Kabalevsky's two Cello Concertos were first bracketed by Olympia in 1993 (OCD 292) with a cellist much patronised by that label, Marina Tarasova. There the conductor was Veronika Dudarova. These reappeared on Regis and Alto. Before that there had been separate LPs of the two concertos by Daniil Shafran, both conducted by the composer, in the case of the First dating from April 1952 and the sombre and gritty Second from 1967; this time in Leningrad. Raphael Wallfisch recorded the Second for Chandos. Right from the outset, Torleif Thedéen's articulation is meticulous and achieved often under pressure. He also delivers a thriving richness of tone. The First Concerto (another Youth product) has all the vital and poetic virtues of the middle two piano concertos. Thedéen and Eiji Oue are at one also in giving voice to the score's abundantly rewarding lyrical side. It is the most Myaskovskian of the works so far. After a measured and gently weighted middle movement the finale bristles and virtually throws its hat high in the air. The Second Concerto dates from fifteen years later. This is a more subtle, oblique, stern and even desolate work by comparison with the First. The difference has parallels with the contrast between Shostakovich's First and Second violin and cello concertos. Thedéen and Oue do nothing to underplay that this score inhabits a very different world as the niente fade of the finale proclaims. That change of gear is not softened in the least by the vigour of the central movement which bespeaks a merciless chase rather than the skip-games of the piano concertos. The Colas Breugnon Suite is driven taut and fast. The leash strains and the coachman's whip snaps. Adrian Prabava mixes acid and adrenaline, recalling the outer movements of Shostakovich 2 and the same composer's Festive Overture. The Colas Overture has been done repeatedly - the equivalent of Rachmaninov's famous Prelude. Here we get three other movements: a bouncy Fête Populaire, a Fleau Publique in the form of a drum-dominated, catastrophically louring Largo and a final Insurrection - a conspiratorial march with nightmare echoes of Berlioz's Symphonie Fantastique. One can sense the paving stones being loosened and hauled up by the mob. Will we ever hear the other Kabalevsky operas or for that matter the orchestral works To the Memory of the Heroes of Gorlovka (1965); The Eternal Flame in Bryansk or The Heroes of the Revolution? There are also some seemingly imposing choral-orchestral scores, including Poem of Struggle (1930–1931); Vast Motherland, a cantata (1941–1942), On the Motherland, another cantata (1965); and A Letter to the 30th Century, an oratorio (1972). You may shudder at the titles but we seem to have overcome such unmusical scruples for Shostakovich, Prokofiev and Khachaturian. There we have it: across these three CPO volumes and the four symphonies aspects of a composer that are predominantly superior entertainment with a heart but in a few cases subtle, oblique and chastening.